WASHINGTON — A coalition of 11 states has filed a legal challenge to the Trump administration’s decision to delay new chemical plant safety rules from taking effect for at least two years. The group led by New York Attorney General Eric Schneiderman filed a petition for review by the U.S. Court of Appeals for the District of Columbia Circuit. 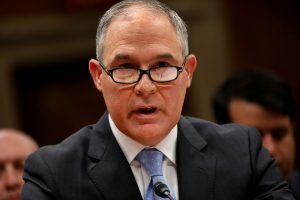 The states say Environmental Protection Agency chief Scott Pruitt exceeded his legal authority by delaying the new Accidental Release Prevention Requirements until 2019. The Obama-era regulations are aimed at preventing explosions, fires and poisonous gas releases at more than 12,000 chemical facilities across the country. In addition to New York, the other states joining the lawsuit are Illinois, Iowa, Maine, Maryland, Massachusetts, New Mexico, Oregon, Rhode Island, Vermont and Washington. READ MORE: Has the moment for environmental justice been lost?